Games Workshop has started taking orders for their new eCodex: Legion of the Damned. Reserve your copy now. 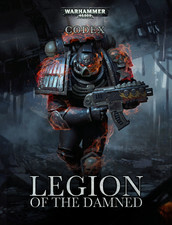 Codex: Legion of the Damned allows you to add Legion of the Damned squads into your Warhammer 40,000 army, or field them as a detachment in their own right. It includes extensive background on the mysterious Legion of the Damned, detailing the times they have appeared to fight alongside the armies of the God-Emperor. Also inside you will find rules for Legion of the Damned units, as well as three new missions, an artefact and Warlord Traits and, all unique to these legendary warriors. This interactive edition features quick-links to special rules for ease of reference during your games.